Do not buy any signs from India or Argentina, they are realistic looking fakes with artificial aging, especially Lincoln Telephone Company signs. Flanged signs are usually ok (but not always) check the side of the flange that would face the wall, it should be either white or a sloppy mix of white and blue on 1908 pattern or earlier signs. It should not be uniformly blue on early (pre-1921 signs). It may be blue on 1921 signs and is usually blue on a 1939 pattern sign. Square one-sided signs are often fake (but not always). Check the back, it should be a uneven white glaze, often pitted, not neat or uniform. Early signs (08 and 21 bell and before) have raised lettering made by building up the enamel. Repros are either flat or have raised letters from stamping the tin. Always look at the back of a one-sided Bell System hubcap sign. For mid-century types, the back should have a 2-digit model number and/or a reddish smudge on white enamel. Earlier types have sloppy looking enamel. Signs from affiliated Bell System companies are generally safe, although make sure it is made of steel and has a white back. Reproductions of Pennsylvania Bell and Ohio Bell signs are known to exist made of tin with green backs. They are marked as reproductions, but sometimes the seller does not notice this fact. Ande Rooney manufactured fake signs, they are marked with the company name on the back, but this can be removed. Always check the seller's other auctions. If he has a number of similar signs, with similar weathering patterns, STAY AWAY!!! Don't let the $199 BIN fool you, this is another fake hubcap. Painting the back white is a nice touch but note that the screw grommets are placed at 12 and 6 o'clock. 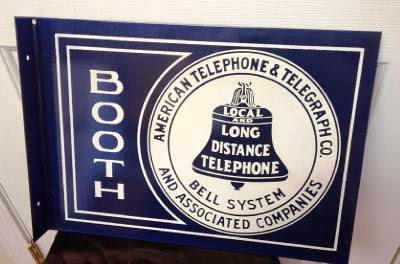 And look at the lettering in "Bell System", what a mess!!! THIS IS A GREAT OLD SIGN. VERY NICE SHAPE FOR ITS AGE.NEEDS A LITTLE CLEANING. ZOOM IN ON THE PICTURES TO SEE CONDITION. So what's your take on this WU Telegram sign I bought? The idea that a four-year degree is the only path to worthwhile knowledge is insane. I have seen three different examples of this sign. and sign #3 was about 8 or 10" square and was a very nice original porcelain sign. This sign looks like #2, the damage to the metal and paint would appear different if it was #1. I am interested in a porcelain example of this sign. This guy has sold a couple of these. Regarding the AT&T booth sign presently on ebay. that the young girl had found his "stash". He was a local politician and died a few years later. Never did see them for sale on the local scene so always wondered what happened to them. Also wondered how they found their way to Montana, of all places. The wisest word in collecting is still "education". Whether its telephone signs or Barbie Dolls. I am not accusing anyone of misrepresenting reproduction signs at the real thing however these two very similar auctions caught my eye. India is a notorious producer of convincing fake porcelain signs. The signs they produce are artificially aged and the backs are artificially rusted with chemicals or salt water. The authentic versions of this sign illustrated in Bob Alexanders A Collector's Guide to Antique Porcelain Telephone Signs illustrates a version that has the two holes placed towards the middle top edge of the sign, as if hung on a bracket, not in the corners as depicted in these examples below. Also, is the rust orange or dark brown? Authentic rust is usually dark in color while more recent rust is more or a red/orange color. Antique 1920-30s Original Railroad/Subway/Bus Pay Station Direction Sign. Heavy gauge metal porcelain in black and white. In good used condition, slightly bend - believe to be mounted on a large column. Does show wear and use, chips,rust and/or scratches. Please see photos closely, item in as found uncleaned! Super rare 18" by 5.5" smaller sign- but try to find another! An addition to any collection,thank you for looking and please see my other listings. This auction is about OLD PAYSTATION Porcelain Enamel Sign board. This sign was used to advertise the type brand outside a dealer's store. It has got four screw fitting holes. Very beautiful enamel sign board! Got wear & Tear around the cornors (Check the pics). Size is 18 x 5.5 Inches.Approximately. Please check the pics and buy. THANK YOU AND HAPPY BIDDING.